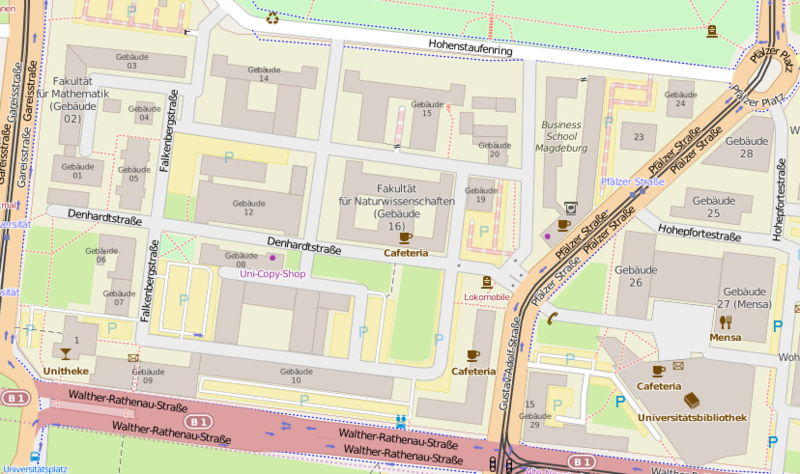 The Magdeburg Internet of Things Testbed (MIOT-Testbed) at the University of Magdeburg is a non-commercial research testbed with the focus on wireless mesh networks and wireless sensor networks. Currently it consists of 35 nodes located in the work group "Communication and Networked Systems" (ComSys). In the final stage the testbed will comprise 100 nodes deployed on the whole University campus. The testbed follows a hybrid approach. Each so called MIOT-Node consists of an embedded PC board, equipped with up to three IEEE 802.11 network cards, and a wireless sensor node. 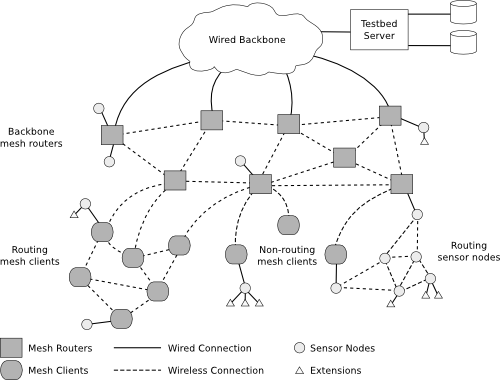 The core of the testbed, called MIOT-Mesh, is formed by the IEEE 802.11 network, while the wireless sensor nodes create a parallel testbed called MIOT-WSN. The research focus of the MIOT-Testbed is primarily on comparisons of simulations and real world studies. As recent publications showed, there is still a severe difference in the results obtained from simulation environments compared to real world experiments. Most network simulators abstract from the wireless medium and do not consider an operating system being used on real hardware. The properties of the operating system, especially scheduling strategies and multi-threading, can affect the behavior of the algorithms and therefore influence the outcome. Additionally, the architecture of the network protocol stacks has to be considered. When implementing algorithms real world systems, the Application Programming Interface (API) of the underlying operating system kernel has to be used. Very often, simple modifications cannot be implemented easily. In simulation environments however, there are little restrictions. With the help of the MIOT-Testbed we are evaluating routing algorithms in order to get information that can be used in real world scenarios and improve everyday life applications, for example providing Internet access in rural areas that lack a wired infrastructure. Next to these research activities is the combination of sensor nodes and mesh routers based on IEEE 802.11 yielding further opportunities. The two components form two coexistent testbeds and take advantage of the features arising from the hybrid approach. The sensor nodes provide an additional network interface to the mesh routers and therefore offer channels in the ISM frequency band that are orthogonal to IEEE 802.11. Additionally, the MSB-A2 boards can be equipped with sensors and actors that can also be utilized by the mesh routers. Similarly, the sensor nodes exploit the hybrid infrastructure to establish virtual connections with far away nodes using the Ethernet backbone. The wired connection also provides an additional reliable packet loss detection mechanism. The constraint of limited power resources can be simulated by measuring the power consumption using a coulomb counter and shutting off nodes if a certain threshold is exceeded. The MIOT-Testbed is also used in daily teaching activities giving students the opportunity to apply their knowledge attained in classes. Around 5 students are working on their theses at all times using the MIOT-Testbed.